I was meant to be reading a different novel this week, but when I picked up The Illiterate, by chance, I found myself unable to turn away. I have spoken French for more than thirty years, I have written in French for twenty years, but I still don’t know it. I don’t speak it without mistakes, and I can only write it with the help of dictionaries, which I frequently consult. You can feel her passion for what was once the only language for her, Hungarian. You see her frustration with communicating and writing literature in another language, one she has to labour over. And yet, it is partly her struggle with French that creates such interesting prose. In The Notebook and the following two novels that form a trilogy about twins sent to live with their grandmother during the war, the writing is stronger for its focus on what the writers of the notebook, the twins, call simple fact. There is no florid language, only simple statements whose truth echoes with unspoken deeper emotion. 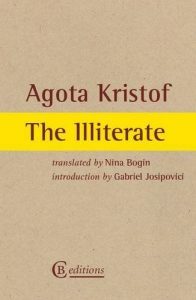 Agota Kristof reminds us that we don’t need to use the wider edges of an extended vocabulary if we focus on precision. Clear simplicity has an eloquence all its own. The Notebook has become one of my favourite books. Being allowed to taste that particular quality of her prose again and to learn about how it developed in The Illiterate was a real pleasure. 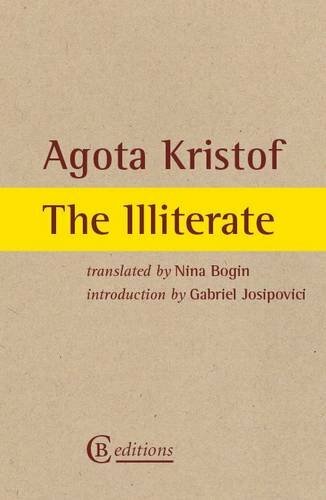 Agota Kristof is a central feature in my literary landscape so it was no surprise other novels fell away when I opened The Illiterate. I may write two reviews next week because after The Illiterate I was diverted from my course again by the novel White Lies by Lynn Michell. I’m not being very disciplined in my reading or my writing at the moment so I hope I can take Agota Kristof’s answer to how you become a write to heart and rediscover that sense of faith.